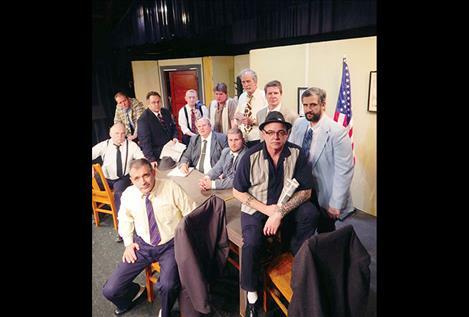 Jurors in "12 Angry Men" include Bud Davis, seated with newspaper, and Bob DiGiallonardo, Ron Martin-Dent, Jim Siragusa, Steve Alexander, Louis Jepson, Les Lundeen, Jeff Jennison, Nick Marquardt, Neal Lewing, Mike Gillpatrick and Kyle Stinger, clockwise. POLSON — Even though a snow-related accident took out the Highway 93 theatre sign on the south end of Polson, “The Show Must Go On,” as The Port Polson Players, in association with Mission Valley Friends of the Arts, present Reginald Rose’s award winning play, "12 Angry Men," on stage at Polson’s beautiful Theatre on the Lake. The show plays two weekends, March 22, 23, 24 and March 29, 30, and 31, with curtain Friday and Saturday evenings at 7:30 p.m. and Sunday matinees at 2 p.m.
Director Neal Lewing has set the Players’ production of this classic in the late '50s, when the show was written. In all 50 states, women didn’t serve on juries until 1973. In the script for "12 Angry Men," eleven jurors are convinced the defendant, a teenage boy, is guilty of murder; the 12th has no doubt of his innocence. Tickets are $16 for adults and $15 for senior citizens and students. The show is recommended for adult and high school audiences. Go to PortPolsonPlayers.com or call 406-883-9212 for reservations or more information.